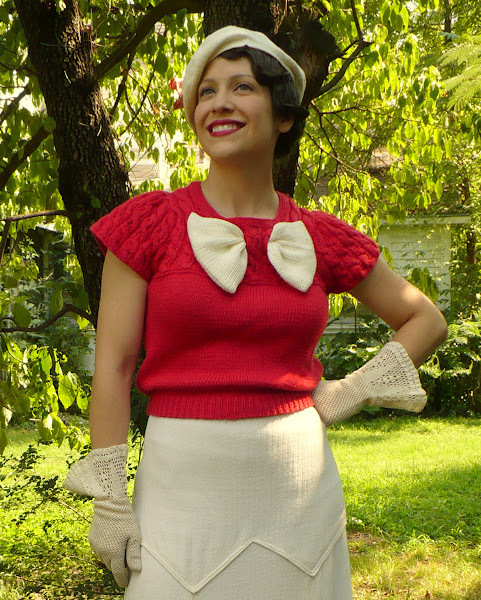 This Old Life: Altered Knits: Easy Miss Lemon-Inspired Sweater, And A Blog Award! 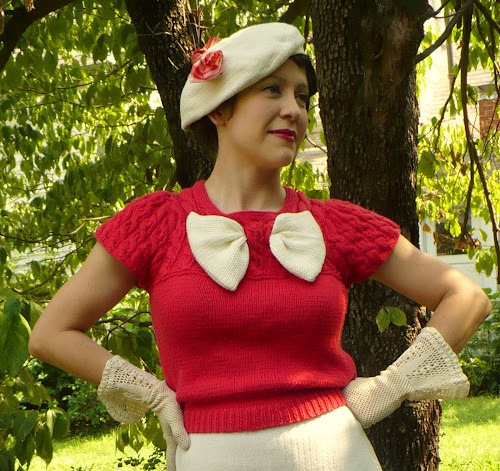 Altered Knits: Easy Miss Lemon-Inspired Sweater, And A Blog Award! I found this pretty sweater at Goodwill for a few dollars and knew that it just needed some embellishment. I had been watching Poirot recently (as usual), and thought that a big knitted bow à la Miss Lemon would be perfect! 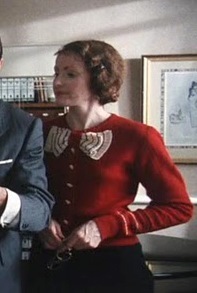 I know we've all coveted this cardigan worn by Miss Lemon in the Poirot episode "The Adventures of the Clapham Crook". It was worn again by another character, Ann Shapland, in a later episode, "A Cat Among the Pigeons". Gemma of Bake Do and Mend put her knitting skills to good use by making her own lovely version of the Miss Lemon sweater. Isn't that brilliant? This one was very easy to make. I don't have a picture of the sweater before I cut into it, but it basically looked the same as it does now, just MUCH larger and without the bow. To give you an idea of how much I took in on the sides, it was actually sleeveless before. I also shortened it by about 5 inches by cutting off the bottom band, taking it in, and reattaching it. As I mentioned in a previous post, if you don't have a serger, make sure you use the zigzag stitch for this, or you will be in big trouble when you try to put it over your head! As with everything else, I learned this the hard way :) For the bow, I took a sleeve from another sweater whose weave was identical to the bottom section of this sweater. I basically made a tube the size that I wanted the bow to be, turned it right side out, and slipped it through the holes that were already in the sweater, tacking the ends of the bow to the sweater on the inside to finish it. Quick and easy! 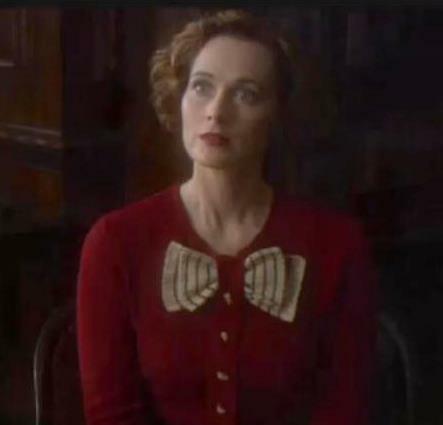 For all of you talented knitters out there, I found a pattern in a reproduction knitting book, which you can purchase here, that is very similar to Miss Lemon's sweater. Isn't it pretty? If anyone makes this, please let me know; I want to see pictures! I've been thinking that I might embellish the bow somehow; either by embroidering my initials, one on each side, or by making some stripes like in the original sweater. The sweater is a coral/salmon color, so I was considering perhaps a turquoise-colored yarn for the accents. What do you think? Any other suggestions? Also, I'm so honored to have been given two blog awards! Okay, it was really one blog award from two separate people, but my ego wants to call it two :) Thank you to Beth from V is for Vintage and to Susan of Susan's Diary-Vintage Style meets Heavy Music for giving me the Irresistibly Sweet Blog Award! It seems that along with this award I must share seven random facts about myself, but I could only think of six things that were different from the ones I listed last time. I guess I'm not that interesting :) So here goes! 1. I've been a vegetarian for 20 years, but I have to try really hard to eat my vegetables; I'm more of a carb-etarian. 2. My favorite cartoon character is Jerry Mouse, but I'm fairly certain it's because he dances with Gene Kelly in "Anchors Aweigh". I grew up watching musicals, not cartoons. Plus, anything that involves Gene Kelly is automatically my favorite. Except Xanadu. 3. My second-favorite period in history is the American Revolution. I am named after Abigail Adams, the wife of John Adams, and chose my screen name of "Nabby" after their nickname for their daughter, who was also named Abigail. 4. I love gardens, but not gardening. I have the blackest black thumb around, but I keep trying every spring! 6. I hate to cook and am terrible at it, but I have a few easy-yet-impressive dishes that I can make very well. I basically alternate these three dishes each time I am asked to bring food to an event, and in this way I have convinced people that I am an awesome cook! As usual, if you decide to participate in passing along this award (I know that some people don't really do them, and that's okay! I still like to give them. ), you just need to acknowledge the giver, list seven random facts about your self, and pass it along to some other blogs you love. And thanks again, Beth and Susan, for my award! Great work - I'm a huge admirer of your vintage style-me-ups! And thanks for the blog award. Beautiful!! I just love what you did. :) I'm a huge Poirot lover, too. I adore Henrietta's clothes in The Hollow. Oh that is lovely! You always look so spot on! You did an amazing job on the sweater! So smart I love it. When you know how to sew, you can even knitt...!!! So cool!!! Some embroidered stars can be fine and your bow, I would keep the same coral color!!!! Congratilations for those awards, I check your recommanded blogs, really nice! Merci, merci!. I have to sit down this weekend and figure out what I'm going to post in exchange. Fabulous... as always. And thanks awfully for the award! I've just read your blog and I love every outfit! You look stunning! I really need to learn sewing! Gorgeous top!! I am so impressed by your ability to take bland thrift store schlock and transform it into perfectly chic '30s ensembles; you're amazing! Thank you for sharing your costumes! I did a quick run through of your blog and they look lovely! I do history costumes through the eras with my kids for our history presentations and I was stumped when we did this era a few years ago! I love the quality of your costumes! ps...Gene Kelley is a favorite of mine too (except for Xanadu). OH! I think your blog and your sweater are awesome, I'm so glad I "found" you through Lauren! Wow! Poirot is my biggest sorce of inspiration! I can watch those series over and over just for the clothes! Good work with the jumper! Oh my goodness, how have I not found your blog before now! An instant add to my feed reader. I adore this sweater (and your other altered knits). I love Poirot so the inspiration is perfect. As a knitter and a huge fan of knitwear in general, I admit my vintage knitwear is severely lacking. I need to do something about that! I cannot believe how creative you are!! I just found your blog today and am simply gobsmacked at what you have done. Everything is wonderful. I happened upon your blog as I was looking for fashions for an online book discussion group that I am on about D E Stevenson's books. She is a wonderful novelist who wrote from the thirties to the seventies. Most of her books are out of print but the group is very active. We talk about many things and for some reason lately I have been on this kick of trying to find fashions that fit the descriptions in the stories. In one called Miss Buncle's Book, Barbara Buncle gets a make-over and one of the new items she buys is a " bottle green coat with a fur collar and a hat to match"! Your green coat IS it!! The book takes place in the thirties. I wonder if you would mind if I added your photo to our DES Fashion Photo page? I am sure the other members would be as thrilled as I was to see it.